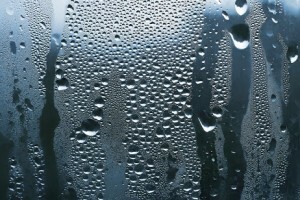 Condensation on the window glass can be a problem no matter how old or new your windows are. Let’s say that you recently had replacement windows installed. The main reason for this is that you got tired of seeing fog on the glass, no matter how hard you tried to clean it. However, condensation on the window glass can be a problem no matter how old or new your windows are. Here are some questions you may have while dealing with this issue. Condensation happens fairly often, and it doesn’t matter if it is cold outside or warm. When water vapor turns to liquid, that’s when you see drops of water on your windows. This happens because the glass is colder than the air around it. You might notice condensation forming on drinking glasses or eyeglasses, especially after stepping out of a steaming hot shower. It’s perfectly normal to see condensation on your windows, even if they are replacement models. Condensation will form on your windows most often during the summer. But since summer won’t be around for several more months, you might be baffled when you find it forming during the winter. That’s because the air outside your home is frigid, while the air inside your home isn’t because you’ve been running the heat. The resulting humidity causes the condensation to collect. Even if you don’t think the condensation is a problem yet, it’s best to be proactive. That’s because if the condensation never goes away, it’s a sign that something has gone wrong; for instance, your energy bill will be going up because the windows aren’t doing their job in holding the heat in. Fog on the inner glass is a sign that the gas fills have disappeared. Depending on the type of windows you have, seal failures may happen more quickly. Wooden and vinyl windows can both be affected by this issue, especially if mold and mildew start to grow in your kitchen or bathroom. If the condensation is between the panes of glass, then the first step is to clean them up. If this doesn’t help, then it’s a sign that the seal has failed, allowing moisture inside the window. The only recourse is to replace your windows again. When choosing a new vinyl window, be on the lookout for some components known as warm-edge spacers. These help improve condensation resistance. This entry was posted on Tuesday, January 15th, 2019	at 4:01 PM	and is filed under Windows	. You can follow any responses to this entry through the RSS 2.0	feed. Both comments and pings are currently closed.